Coach Vonn Read has submitted several plays from his book The Basketball Encyclopedia of Plays to the Coaching Toolbox. Vonn is the Associate Head Coach for the Women’s program at Syracuse. He has also served as an assistant coach in the WNBA with the Phoenix Mercury, Orlando Miracle, and San Antonio Silver Stars. He was an advanced scout for the Orlando Magic as well as The Charlotte Sting. 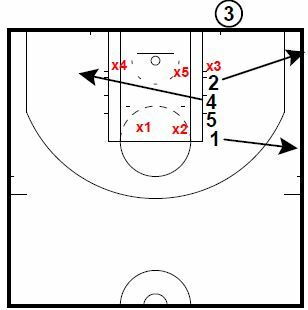 This play is a short seconds inbounds play from underneath the basket. 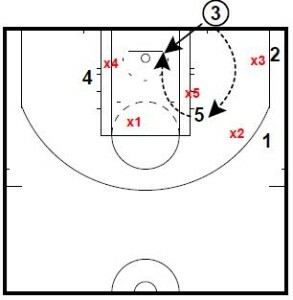 This is a good short clock UOB play against a 2-3 Zone. The 2 player will cut hard to the corner. The 4 player will cut hard to the block. The 1 player will pop out to the wing. The 3 player will pass the ball to the 5 player for the quick shot. If X5 steps up to guard the 5 player on the pass, the 5 player can jump up to tip the ball to the 3 player stepping inbounds from the baseline for a layup. The taller the 5 player, the easier the tip pass will be.